An original blend of nature-inspired musical impressions created by members of the talented Mulfinger family. 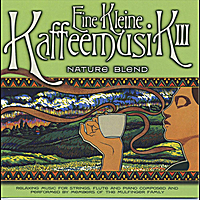 The addition of flute brightens this brew and provides a pleasing contrast to the soothing sounds of strings and piano. Copyright © 2019 Sharon Gerber Musik.